My dad’s chili is legendary. It really truly is – he’s won cook-offs and everything. 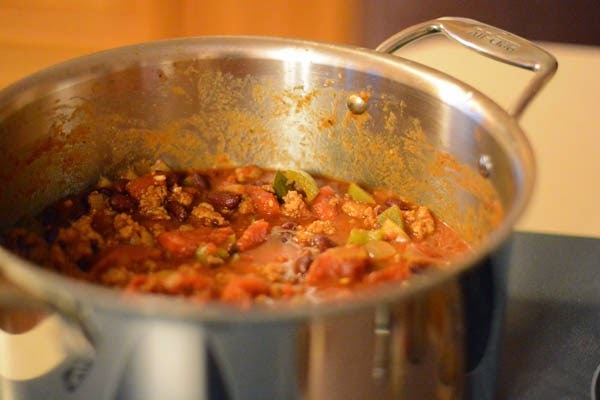 This recipe is not for my dad’s chili (because he doesn’t write one down) But now that I live 2-1/2 hours away, I had to learn how to make my own. 1- Heat a large Dutch oven on medium-high heat. Add in the ground sausage (remove casings if necessary) and beef and set them to browning for a minute or two. 2- Add in the garlic, onions, and peppers. Let that cook until the meat is well browned and the peppers/onions are soft. Stir it all up. 3- Add everything from the chili powder-bay leaves and cook for a minute or two getting it all well and stirred in. 4- Add the tomatoes (the best way I’ve found to coarsely chop those bad boys is make your three year old wash his hands REALLY well and then set him to town squashing) and beans. 5- Cook uncovered for about 30 minutes before serving. Remove bay leaves (or if you are like us and a bay leaf in your dish means you doing dishes – add them to the Misters bowl) and serve with grated cheese, saltines, and/or sour cream. And I know some people put noodles in their chili but that just makes it goulash, so I don’t. If you’re one of those weirdo’s you can certainly do that with this recipe, just don’t tell me about it. Family dinners are a great time to practice gratitude and thankfulness. In our family, we have a prayer board and each week we offer up a different prayer of thanksgiving. If you are interested in doing this, all you need is a google search to get some suggestions. If prayer isn’t something you’re comfortable with, just go around the table and share some daily blessings.